This statement informs the way we manage the site. Narroways Millennium Green LNR covers approximately 2.5 hectares and is situated in the Northeast part of Bristol, to the west of the M32, in St Werburghs. The site consists of mixed habitat of grassland, scrub, hedgerows and broad leaved woodland. Some of this grassland is unimproved (low nutrient) with good species diversity and includes admixtures of both calcareous (lime loving) and more prevalent neutral grassland. There is a landscaped garden, which possesses a small pond. The site is owned by Bristol City Council. 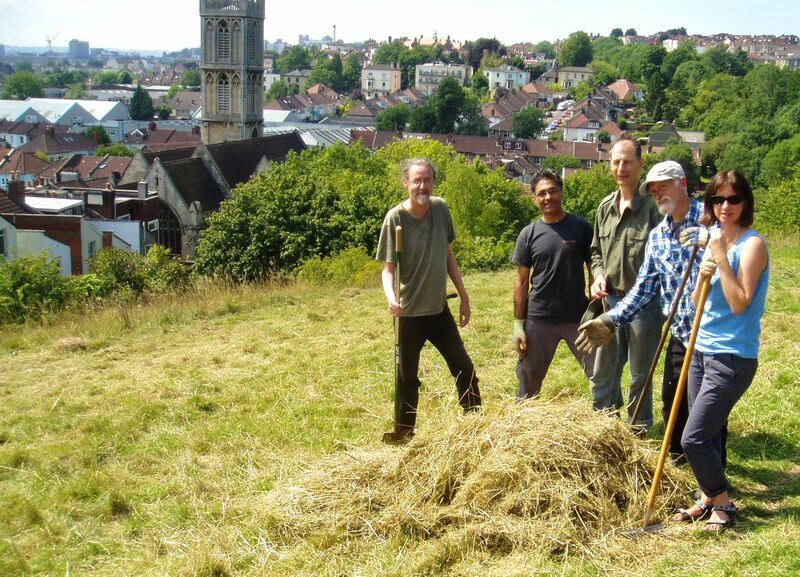 To maintain and enhance unimproved meadows by appropriate management by annual hay cutting in July or August with all arisings being removed and put into scrub areas to provide different habitat (especially for hedgehogs and other mammals). An early cut in early April may also increase competition from desirable herbs over more competitive grasses. To reduce and control scrub encroachment onto meadows: brash piles may be created in scrub woodland surrounding meadows. To thin areas of scrub periodically and allow to regenerate, to create diversity of age and structure: brash and log piles can be provided in woodland for greater habitat diversity. To maintain principle paths on the site and the fence surrounding the site, where this fence is the responsibility of NMGT. Woody plants: 17 tree and shrub species recorded in 2004 survey (Phil Quinn). Herbaceous Plants: 108 species recorded (mostly from 2004 (Quinn) grassland surveys) including the nutrient poor (unimproved or species rich) grassland indicator species; Corky Fruited Water Dropwort, Common Restharrow, Upright Brome, Black Knapweed, Wild Carrot, Bird’s Foot Trefoil, Agrimony, Autumn Hawkbit, Rough Hawkbit, Lady’s Bedstraw, Field Scabious, Sweet Vernal Grass and Yellow Oat Grass. Meadow management is desirable to maintain and enhance these populations. Other species recorded in previous (pre-2004) surveys include Knapweed Broomrape and Hairy Rock Cress. These two species ‘have not been seen for many years’ (Quinn 2004) and hence it is worth surveying for them in future years. Lichens: 13 species have been recorded including a typical suite on ash twigs made up of Caloplaca cerinella, Lecania cyrtella, Lecania naegellii, & Lecanora hagenii. Dragonfly and damselfly surveys around local ponds. Botanical identification training and habitat management advice can be provided by Bristol City Council Woodland and Wildlife Officer.